This is my first experience with the Abigail series by Tali Carmi and I don’t know how I never found her books sooner. The Abigail series is a fun and easy read for adults and an exciting read for little who are beginning to read. My daughter is almost 5 and loves to have stories read to her. Abigail and the Sahara Adventure was given a thumbs up from here. She loved it. The illustrations are artistic, colorful and engaging. We especially enjoyed that her Grandparents were included in the story. Abigail and the Sahara Adventure is about Abigail visiting her grandparents. Her grandfather invented a magical bike that will take you anywhere if you say the magic words “Take me there. let me see, show me where I want to be!” During Abigail’s visit she sneaks away to the bike and looks through the magical book to find her next magical adventure. As she was flipping through the book she came across the most beautiful picture of the Sahara desert and decided that was where she want to go. So she said the magic words and off she went on the magical bike. I don’t want to spoil the story so I’m not going to give anymore details. But through Abigail’s adventure she gets to meet people of different cultures, helps other people and then returns home to her grandparents by saying the magical words once more. My daughter really enjoyed the story and now she wants a magical bike to go off on her own adventures. 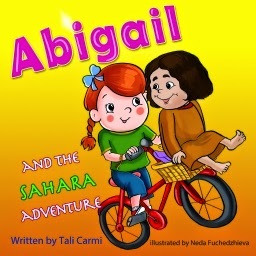 Abigail is a series by Tali Carmi and you can find Abigail and the Sahara Adventure on amazon as well as the rest of the series. I received Abigail and the Sahara Adventure complimentary for evaluation purposes. Regardless, all opinions expressed are still 100% my own. I am disclosing this in accordance with Federal Trade Commission 16 CFR, Part 255 Guides Concerning the Use of Endorsement and Testimonials in Advertising.